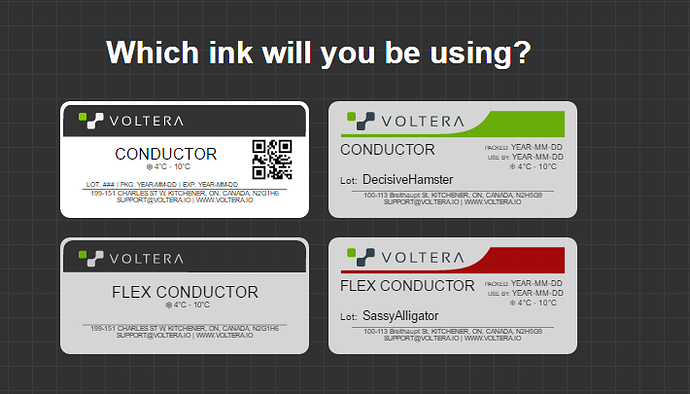 Our cartridge labels have gotten a redesign! Material types can now be easily distinguished based on the label color - no more fumbling with cartridges to see which one is which. Print Settings depend on the material you choose, AND the LOT number. Over the past year, your feedback has prompted us to grow the selection of materials we offer on the store - We now stock Conductive Ink for flexible substrates, as well as Solder Paste specifically for HASL-finished fabbed PCBs. By prompting users to select which paste or ink they’re using, we make sure the V-One is using the right print settings for the right material - ensuring you get the best print possible. One of the realities of producing chemicals in large volumes is that there will be slight variations between production lots, even those that pass quality control. While these usually don’t impact print quality, in some cases it may require slight tweaks to the print settings (as some of our users recently noticed when their solder paste flow rate was decreasing over time). With lot-specific print settings, which we configure during our QC process, we can now ensure that everyone is getting the best print possible. 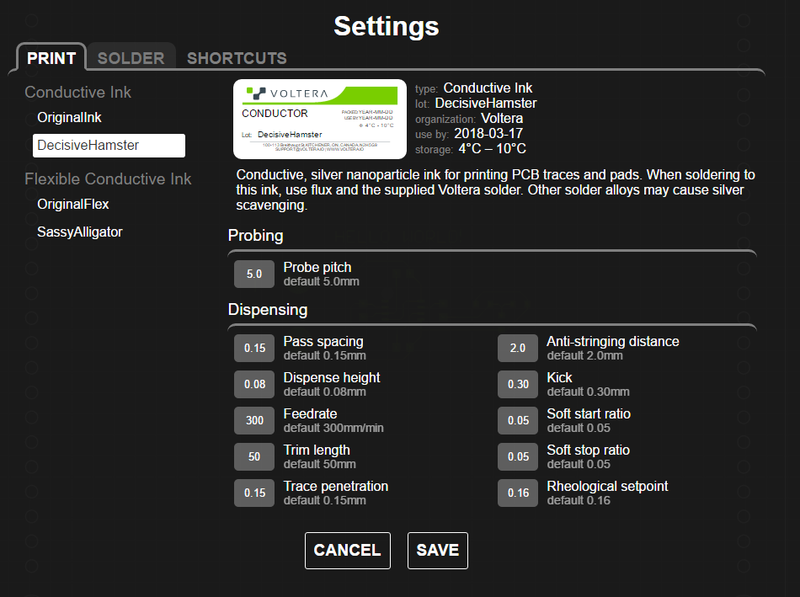 We can include information like best-by dates right in the app, to help you ensure your conductive ink and solder paste will perform as expected. You can also easily check available lot numbers from settings window - no need to disassemble your dispenser if you forget! For those of you play it fast and loose with the best-by date (not recommended) - don’t worry. ‘Historical’ lots and their associated settings will continue to be stored in the app after the rest of the world has moved on. This change also signals the starting point for something we’re really excited about here at Voltera - custom dispensing profiles! While the V-One started out as a PCB prototyping tool, more and more of our users have been using it to print all kinds of materials for many different applications - printed batteries, encapsulants, biosensors… the list goes on. We’re constantly astounded at the ways our users have found to push the boundaries, and we’d like to support this type of experimentation as much as possible. We’ll continue to build on this concept incrementally in future updates, to help simplify the process of dispensing your own materials and tweaking settings. Gone are the days of a cluttered settings window that smashed paste, ink, and general settings in one pane. To support the changes described above, the settings window can now be navigated by material type and lot number, with print settings and special instructions for each clearly stated. That’s it for this update - if you have any questions / comments, let us know! Is there any plan to make a future release possible to use on non closed source systems? Like anything Linux, BSD, Unix, or similar would help. We have had a few requests for Linux support in the past - however, when we polled our users for their feedback on upcoming feature requests a while ago, we found that it lagged behind other enhancements and features quite a bit. Since we’re still a small and focused team, we need to prioritize pretty aggressively, so for the time being Linux support isn’t on our roadmap. That being said, if you have a use case or particular circumstances which require Linux support, feel free to tell us all about it - it might help make a case for pushing up Linux support!